I love marketers; always so accommodating to our Latin lifestyle! Whatever that might mean. 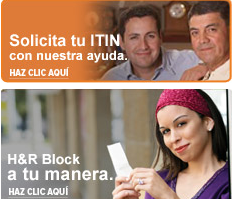 In the most recent sign that Corporate America really likes us (and wants our money) H&R Block today announced that it has opened not one but 257 Latino offices designed specifically to serve Hispanic tax payers. “These new offices have been designed to provide a family-friendly and culturally inviting environment for Latino clients. The offices feature work by local Hispanic artists, a children’s play area and magazines, all designed to make clients’ overall tax preparation experience easier and less stressful,” said the company in a press release. Oh, such disappointment! And I thought accommodating Latinos meant we would have “tamale” vendors while we wait, or direct access to Mexican accountants specialized in not paying taxes at all, or at the very least coyotes for hire available to do the trámite for us with a simple mordida.